In this series, I will attempt to elucidate events in the past that are either ignored or suppressed by governments, education systems and mainstream media in the West. In particular, my focus will be on colonialism, with reference to specific large-scale affairs involving plunder, exploitation and destruction, that have left ineffaceable scars on nations around the world today, scars that indigenous populations still feel to this day. The first Aboriginals of Tasmania are thought to have reached their eventual homeland from Southern Australia, across a glacial land bridge that formed in the Bass Strait due to the Ice Age, in the late Pleistocene, around 40,000 years ago. From then on, the Aborigines (or Palawa) remained there (due to sea levels rising again to flood the land bridge, preventing any travel between Australia and Tasmania) , largely undisturbed, until the arrival of the British in 1803. It is worth noting that, before 1803, other Europeans made contact with the natives there. In 1642, Dutch explorer Abel Janszoon Tasman journeyed to what he called ‘Van Diemen’s Land’ (which was legally changed to ‘Tasmania’ in 1856). However, Tasman did not come into contact with any Aboriginals, who called their land ‘Trouwunna’ or, as the reconstructed Palawa Kani language translates it, ‘Lutriwita’ . Captain James Cook named Van Diemen’s Land a British penal colony in 1788, which was a result of an endeavour to replace settlements lost due to American Independence. Economic and social affrays began soon after the invaders arrived, as the British food supplies were not able to meet the nutritional needs of the settlers. Grain and salted meat supplies from Britain and other colonies were scarce and, when they did arrive, they were water damaged, infested with weevils or were completely inedible. This led to serious illness amongst the settlers in the winter of 1803-1804, prompting them to hunt for food endemic to Van Diemen’s Land, such as kangaroos, wallabies and emus. Though this saved many of the colonists’ lives, it significantly reduced the island’s animal population, resulting in serious tensions between the invaders and the natives. 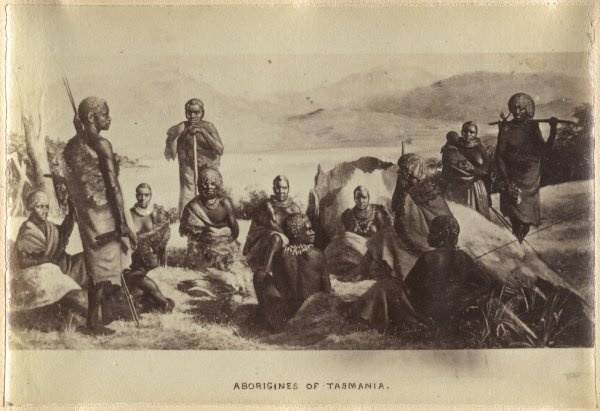 The colonists brought British families, convicts (who were either used as servants to manage pastoral settlements, or escaped and became sealers or bushrangers) and soldiers to Tasmania, with their numbers increasing every year. Invaders monopolised whaling and sealing industries, establishing timber industries which further compounded the socioeconomic conditions of the Palawa. From 1809, the settlers began killing Aboriginal parents and abducting their children, using them as domestic slaves, forcing them to assimilate into their communities, and erasing their Aboriginal connections. Due to the relative scarcity of British women, sealers and other invaders abducted and raped Palawa women, enslaving and trafficking them. Chief Protector of Aborigines, George Augustus Robinson, commented on the sealers’ treatment of Aboriginal women as, “the African Slave Trade in miniature”. In late 1828, due to intensifying violence between settlers and Aboriginals, Governor Arthur declared martial law. This period was the start of what quickly became known as the ‘Black War’. Indigenous dissidence was labelled an act of war against the King, thus giving a governmental imprimatur for the slaughter of Aboriginals. The government offered a bounty of £5 for each adult and £2 for every child captured. The military were given authority to kill any native who resisted, though in practice many Palawa were shot, irrespective of whether they showed signs of violence. Though the resistance was extremely troublesome for the invaders, it faded by 1832 due to the genocide of between 1000 and 2000 Aborigines (likely more in light of the lack of death toll records for the natives). Their decreasing numbers led to surrender in 1833, after they were persuaded by Robinson who had also been relocating natives to Flinders Island, via pressurised migration and forced removal, since 1829. By 1835, Robinson reported to Arthur that, “The entire Aboriginal population are now removed (to Flinders Island)” , which constituted around 300 at the time, compared to over 1,500 in 1824. The natives were forced into exile at Wybalenna camp, away from the mainland, where they were exposed to institutionalised malnutrition, introduced disease, inadequate clothing in freezing weather, vermin-infested, damp huts to sleep in, a lack of fresh food and water and abuse by convicts. Most of them died of respiratory diseases due to the dearth of medical care. By 1847, only 45 survived, and were transferred to an abandoned army camp in Oyster Cove on mainland Tasmania, where the living conditions were no better. By 1876, all the Palawa people had died, apart from a woman named Fanny Cochrane Smith, recognised as the last full-blooded Palawa, who passed away in 1905. Today, mixed Tasmanians of Palawa descent seek redress for their erased history – their language, their culture and people – their stolen generations and colonised homelands. The Tasmanian Aborigines suffer from disproportionate rates of poverty and thus an array of health problems (both mental and physical). Aboriginal youth suffer the highest suicide rates in the world, while mortality rates for infants and young children are 2-3 times higher than those for non-Aboriginals. Most aboriginals live in highly damaging socioeconomic environments, because of the abject inequality – political, racial and economic – that has been carried over since the systematic, geographic, psychosocial and cultural genocide of the Tasmanian Aborigines and the eradication of the foundations of their communal life. Though much time has passed since the genocide, it would be a callow notion to suggest that the present-day plight of the Palawa is unrelated to their past. This is something the world needs to know. It needs to know what happened, and it needs to know why it happened. Now I know where I get my fight from…thanks to my Chief Warrior Tongerlongter!